The world’s first commercial-scale, grid connected wave energy array has been switched on in Perth, Western Australia. It’s the first time wave-generated power has been fed to the electricity grid, RenewEconomy has reported. Carnegie Wave Energy is responsible for developing the innovative project, which has involved almost 10 years of work, including an extensive testing phase. During testing, the first 240KW peak capacity CETO 5 wave unit operated successfully for over 2,000 hours. The wave power project will sell electricity to the Australian Department of Defence, to power Australia’s largest naval base nearby. There is also a planned desalination plant to be integrated into the project, and the fresh water produced will also be supplied to the naval base. 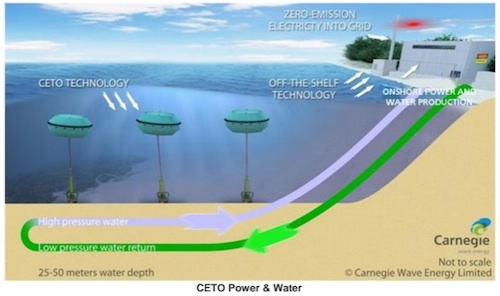 The project’s technology works by moving with the motion of the waves to drive underwater pumps tethered to the seabed. The pumps supply high pressure water to the hydroelectric power plant and desalination plant on land. The Australian Renewable Energy Association funded $13 million of the $32 million cost for the project. Work has already begun on the next generation of the technology, which will involve larger units, with the aim of achieving four times the capacity of the current units. This should improve efficiency and reduce energy generation costs. Now that the new technology is up and running, the goal is to move the technology towards being competitive with other sources of power generation. vào, khuấy đều cho tan (khoảng 2 phút). Sau đó lấy xuống khỏi bếp để nguội.